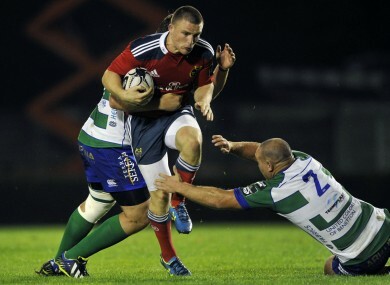 A try in each half gave Munster a comfortable win in Treviso. Anthony Foley got his first competitive win as Munster head coach tonight. AFTER A TESTING two weeks, Munster finally have something to celebrate after a two-try 21-10 win away to Treviso tonight. Munster made eight changes to the side that lost to Edinburgh but it was two holdovers, CJ Stander and Simon Zebo, who scored the five-pointers. In fact, CJ Stander is fast becoming the Miroslav Klose of rugby, as he scored another close range try for Munster to help them to a 13-7 half-time lead. It was Stander’s third try in two Guinness Pro12 games this season. Ian Keatley had kicked his side into a 3-0 lead early on before Treviso fullback Simone Ragusi scored the opening try of the game, which was converted by Joe Carlisle. Keatley narrowed the gap to the minimum with another penalty before Stander crashed over following good approach play from Keatley and Duncan Williams. Munster had a lot of territory in the first half but only lead by six despite their dominance. But they were more clinical in the second half, with Simon Zebo finishing off a nice counter attacking move in the corner after Treviso kicked loosely. Carlisle and Keatley swapped penalties as the game neared its end, and Munster were able to see out their first Pro12 win of the year, and record their first victory in Treviso in two seasons, with relative ease. Email “Tries for Zebo and Stander get Foley off the mark”. Feedback on “Tries for Zebo and Stander get Foley off the mark”.